Technical Report ECE-VCL-2015-2, VLSI Computation Laboratory, University of California, Davis, 2015. The design for a second generation motion estimation accelerator is presented and demonstrated as suitable for H.265/HEVC (MEACC2). Motion estimation is the most computationally intensive task in video encoding, and its share of the processing load for video coding has continued to increase with the release of new video formats and coding standards, such as Digital 4K and H.265/HEVC. MEACC2 has two 4 KB frame memories necessary to hold the ACT and REF frames, designed using a Standard Cell Memory technique, with line-based pixel write, and block-based pixel accesses. It computes 16 pixel sum absolute differences (SADs) per cycle, in a 4x4 block, pipelined to take advantage of the high throughput block pixel memories. MEACC2 also continues to support configurable search patterns and threshold-based early termination. MEACC2 is independently clocked, can sustain a 812 MHz operating frequency and occupies approximately 1.041 mm2 post place and route in a 65 nm CMOS technology node. Taken together, MEACC2 can sustain a throughput of 105 MPixels/s while encoding the video stream johnny_60 with a hexagonal 'ABA' pattern with no early termination, as its worst performance, which is sufficient to encode 720p video at 110 frames per second (FPS). Multiple search algorithms are run against a battery of 6 video sequences using MEACC2. These runs demonstrate the adaptability and suitability of MEACC2 for video coding in H.265/HEVC at high throughput, and also demonstrate the efficacy and tradeoff present in a novel search pattern algorithm, 12-pt Circular Search. 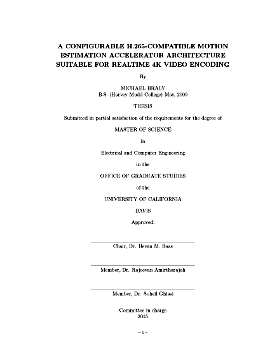 Michael Braly, "A Configurable H.265-Compatible Motion Estimation Accelerator Architecture Suitable for Realtime 4K Video Encoding," Masters Thesis, Technical Report ECE-VCL-2015-2, VLSI Computation Laboratory, ECE Department, University of California, Davis, 2015. This work is supported by UC Davis ECE Department, ST Microelectronics, NSF Grant 0430090 and CAREER Award 0546907, and SRC GRC Grant 1971 and 2321. A copy in the slightly different and new UCD format is also available.